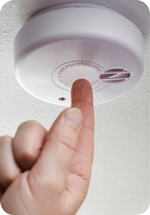 Proper fire alarm installation and maintenance is imperative for the safety of your home. The National Fire Protection Association (NFPA) reports that 60 percent of home fire deaths occurred in properties that did not have working smoke alarms. 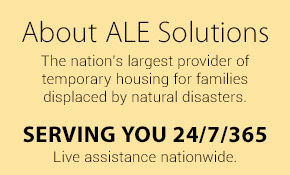 These devices are literal lifesavers when they are installed and maintained correctly. Some fire alarm units may also include a carbon monoxide detector. Carbon monoxide is an invisible, odorless gas that is responsible for approximately 170 deaths in the United States every year. Since it is impossible for humans to detect this gas, having a detector in your home is critical. These detectors can be integrated into fire alarms or installed independently. Fire alarms should be placed on walls or ceilings inside each bedroom, outside each sleeping area and on every level of the home. On levels that do not have sleeping areas, an alarm should be positioned near the stairs and in a major living space. In the basement, alarms should be located on the ceiling near the stairs. In kitchens, an alarm should be installed at least 10 feet away from a cooking appliance. Fire alarms also need to be positioned away from windows, ducts, vents and doors as the air flow from these sources may prevent a fire alarm from working properly. 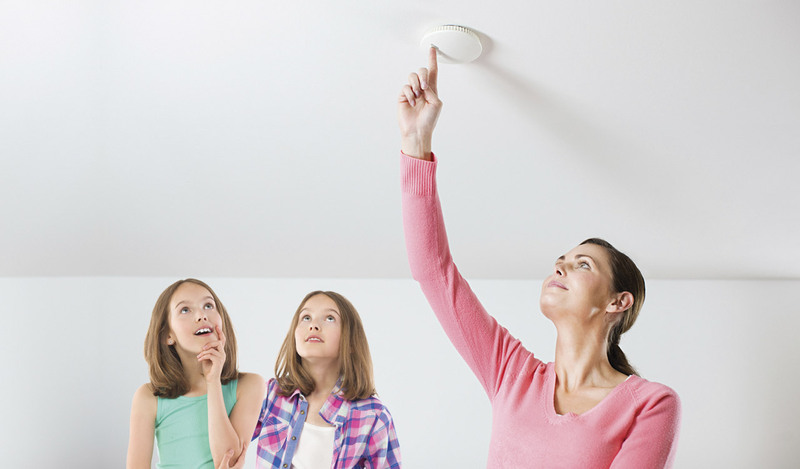 Since smoke rises, it is important to install fire alarms within 12 inches of the ceiling. On pitched ceilings, the alarm must be placed within three feet of the peak. Do not place the alarm within four inches of the peak, as this can affect its functionality. Carbon monoxide detectors should be placed in a hallway or room outside each sleeping area of the home. These detectors can be placed anywhere but should not be accessible to children or covered by drapes, furniture or other obstructions. How Do I Install a Fire Alarm? 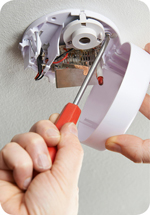 The NFPA encourages homeowners and renters to install alarms that bear the “label of a recognized testing laboratory” and recommend interconnected smoke alarm systems for the best protection. Be sure to hire a professional if you choose to install an interconnected alarm system. For unconnected fire alarms, installation is simple once you have found the ideal location. Follow the instructions on the alarm packaging. Installation typically involves drilling small holes and attaching the mounting bracket with screws. Then insert a battery into the alarm and slip it into the bracket. Once it is in place, push the test button to ensure that the alarm is functioning properly. How Do I Maintain a Fire Alarm? Alarms should be tested monthly using the ‘test’ button on the device. If the test ever fails, replace the battery immediately and test it again. Even with regular testing, the NFPA recommends replacing the battery every year. 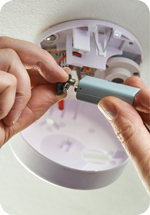 Testing and battery replacement includes interconnected, electric-powered alarm systems, as all home fire and carbon monoxide alarms have a battery backup. Thank you for reading and helping to keep your home safe! Stay tuned for more tips here on Discover! Thanks for the tip on testing the alarms monthly! I knew it was important to test them, but I wasn’t sure how often you were supposed to do that! I might have to set a reminder in my phone to do test them since it’s such an easy thing to forget. I agree that it is important to test your alarms frequently but I didn’t know that it’s a good idea to do it monthly. I will make sure to inspect my alarm system often so I know when it needs maintenance. Thank you for the tips, they are much appreciated. You’re not kidding about the insurance claims needing relted to Fire Alarm Installation and Maintenance . A friend of mine here at college had her apartment broken into, and the insurance company was all over her about proving what was stolen and that she actually did own what she told them they stole. One of my least favorite things to hear is false alarms at work, and so I’m glad that you mentioned misuse of premises. However, it’s kind of hard to keep a kettle from letting out steam. To help prevent the alarm from going off in the future, how far away should kettles be kept from the detectors?